This is, word for word, Anthony Bourdain’s recipe from The Les Halles Cookbook. 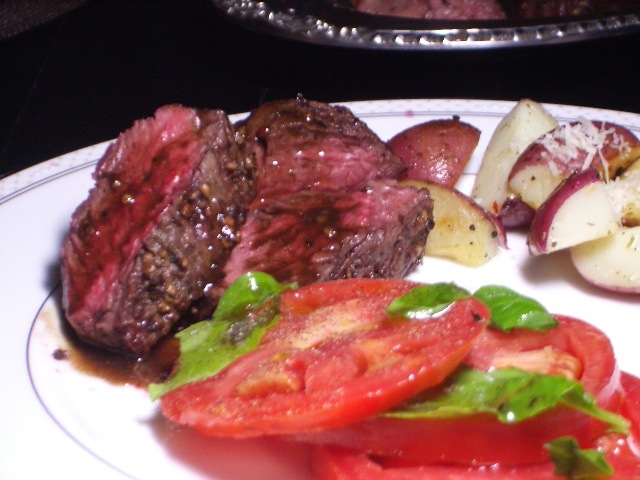 We altered the recipe only slightly: Instead of 4 8 ounce steaks, we got one big hanger steak. We seasoned it whole, seared it whole, and roasted it whole. After letting it rest, we then cut it into medallions and served the pan sauce along with it. 1. Preheat the oven to 425ºF. Moisten the meat very slightly with oil, then dredge each of the steaks in the crushed peppercorns to thoroughly coat. Don’t be shy with the pepper. 3. Transfer the pan to the oven and cook until desired doneness, about 5 to 7 minutes for rare, 10 minutes for medium rare, and so on. Remove from the oven and remove the steaks from the pan to rest. Have I told you yet to always rest your meat after cooking? I’ve told you now. 1. Return the skillet to the stovetop and carefully stir in the Cognac. As much fun as it is to create a column of flame as you add flammable material to an incredibly hot pan, it’s not really desirable or necessary — especially in a home kitchen. Unless you’re a pyromaniac, I recommend carefully adding the Cognac to the still-hot pan off the flame, stirring and scraping with the wooden spoon to get every scrap, every peppercorn, every rumor of flavor clinging to the bottom of the pan. 2. Now place the pan on the flame again and cook it down a bit, by about half. Stir in the veal stock and reduce over medium heat until thick enough to coat the back of a spoon. Whisk in the remaining butter and season with salt and pepper. Serve immediately with French fries or sautéed potatoes. Note on searing: With any recipe that calls for searing meat and then using the pan to make a sauce, be careful to avoid blackening the pan; your sauce will taste burnt. Avoid by adjusting the heat to, say, medium high, so it will still sear the meat but not scorch the pan juices. But stoves and pans vary, so pay attention.